OBJECTIVE: To identify progress and challenges in mental healthcare in South Africa, as well as future mental health services research priorities. METHOD: A systematic review of mental health services research. Literature searches were conducted in Medline, PsychInfo and Sabinet databases from January 2000 to October 2010 using key phrases. Hand searches of key local journals were also conducted. Of 215 articles retrieved, 92 were included. Data were extracted onto a spreadsheet and analysed thematically. RESULTS: While progress in epidemiological studies has been good, there is a paucity of intervention and economic evaluation studies. The majority of studies reviewed were on the status of mental healthcare services. They indicate some progress in decentralised care for severe mental disorders, but also insufficient resources to adequately support community-based services, resulting in the classic revolving-door phenomenon. Common mental disorders remain largely undetected and untreated in primary healthcare. Cross-cutting issues included the need for promoting culturally congruent services as well as mental health literacy to assist in improving help-seeking behaviour, stigma reduction, and reducing defaulting and human rights abuses. CONCLUSIONS: While there has been some progress in the decentralisation of mental health service provision, substantial gaps in service delivery remain. Intervention research is needed to provide evidence of the organisational and human resource mix requirements, as well as cost-effectiveness of a culturally appropriate, task shifting and stepped care approach for severe and common mental disorders at primary healthcare level. A recent review of decentralised community-oriented care in Africa suggests, however, that many countries struggle to implement policy imperatives for decentralised community-based care.7 In light of this, we set out to systematically review published literature on mental health services research in South Africa from January 2000 to October 2010, with the aim of assessing how South Africa has fared in this regard over the past decade. Specifically, we aimed to identify progress as well as remaining challenges in the quest for improving access to high quality mental healthcare through decentralised, integrated and community oriented care, as well as future mental health services research priorities. Literature searches were undertaken in the Medline, PsychInfo and Sabinet databases from January 2000 to October 2010 using the key phrases of 'mental health services', 'mental health systems' and 'South Africa'. Hand searches were also conducted of the tables of contents of the following key local journals: South African Medical Journal, African Journal of Psychiatry, South African Journal of Psychiatry and the South African Journal of Psychology. Inclusion criteria were that articles had to (i) report exclusively on a research study on South African mental health services; and (ii) they had to provide information or recommendations about mental health policy or treatment services in South Africa. Using these search strategies, a total of 215 articles were retrieved. Of these 92 were included on the basis of consensus reached on the above inclusion criteria between the authors and a research assistant. We have distinguished between studies and articles. Where articles report on data sets from a single study, this has been mentioned. Data were extracted onto a spreadsheet which included the following dimensions: (i) purpose/aim, (ii) design, (iii) sample/location, (iv) main findings and (v) recommendations. The articles were then categorised according to: epidemiological studies, status of mental health services, experiences and perceptions of service users and carers, resource and costing requirements, reviews, and intervention studies. The findings and recommendations emanating from the articles were synthesised according to the following main thematic areas covered by the articles: tertiary in-patient care, decentralised psychiatric care for severe mental disorders at primary healthcare (PHC) level, decentralised care for common mental disorders (CMDs) such as anxiety, depression and substance use disorders at PHC level, and cross-cutting issues including HIV/AIDS and mental disorders, stigma and discrimination, cultural congruence and resource requirements. Other articles concerned the quality of inpatient care. Joska et al.,15 in a case study of a psychiatric hospital in the Western Cape, found that the psychosocial needs of inpatients were not adequately met, with the greatest need among the least educated. The need for improvements in both inpatient and outpatient psychosocial rehabilitation programmes was highlighted. Mayers et al.25 and Mkhize26 reported dehumanising experiences and human rights abuses in psychiatric institutions and general hospitals. Both of these studies were conducted after promulgation of the new Mental Health Care Act.5 They suggest lacunae in the implementation of the Act, which has the explicit agenda of promoting care of MHCUs within a human rights framework. As mentioned in the introduction, the new Mental Health Care Act5 introduced a 72-hour emergency management and observation period for MHCUs in designated general hospitals across the country, as well as Review Boards to protect the human rights of MHCUs. Studies conducted after the promulgation of the Act suggest that implementation has not been optimal. Although access to psychotropic medication is largely available at inpatient and outpatient facilities,22 studies by Lund et al.22,27 found that infrastructure and specialist staff for the 72-hour emergency management and observation service are mostly inadequate across the country. A detailed study by Ramlall6 on the implementation of the Act in KwaZulu-Natal over the 5 years ending in 2010 found that 63.9% of designated general hospitals in the province reported inadequate resources, including insufficient designated beds, specialist staff and seclusion rooms to deal with the demand and challenges of caring for disruptive patients - this despite findings that 75.6% of admissions were involuntary or assisted, indicating that the service caters mostly for MHCUs with severe mental illness. Further, while Review Boards are meant to investigate human rights abuses and neglect, the majority of hospital managers surveyed in Ramlall's study6 found the functioning of the Review Boards unsatisfactory in that they were not able to address issues of inadequate infrastructure and resources that contribute to human rights abuses and poor care. Similarly, in the Western Cape, which has a concentration of tertiary psychiatric hospitals, many MHCUs (22%) were found by Lund et al.22 to bypass the district hospital 72hour observation period, being mostly admitted directly to tertiary institutions. 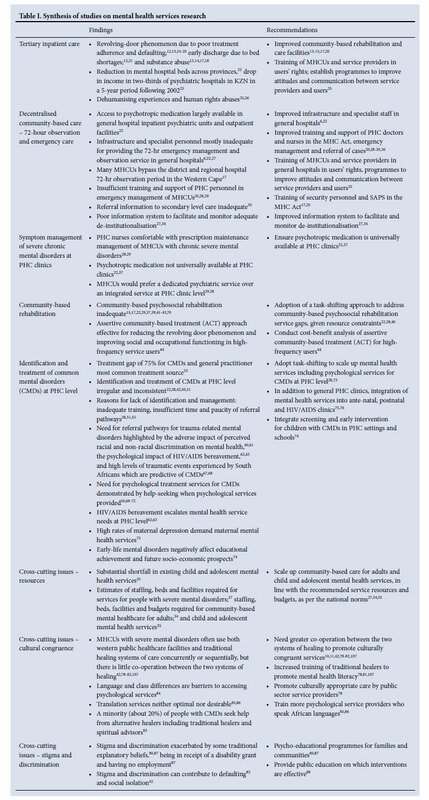 Concerning outpatient services, 3 articles report that PHC nurses and doctors, who are often the first contact with the healthcare system, reported insufficient training and support in emergency management of MHCUs with severe and acute mental illness.20,28,29 Struwig30 also found that referrals to secondary level care had inadequate information. A large number of articles (10) reveal gaps in community-based psychosocial rehabilitation programmes,15,17,22,29,39-43 particularly in rural areas. These articles corroborate those which suggest that the revolving door phenomenon is partly due to inadequate communitybased care, including psychosocial rehabilitation. There has been only one intervention study investigating the efficacy of a modified assertive community-based treatment (ACT) approach that was shown to have good outcomes for reducing the revolving-door phenomenon and improving social and occupational functioning in high-frequency users.44 ACT is individually based and fairly resourceintensive. It may therefore not be appropriate for all service users in LMICs where specialist resources are scarce, but may be cost-effective for high-frequency users. Botha et al.44 suggest the need for a costbenefit analysis of this approach for high-frequency users who are likely to consume costly resources through frequent admissions and use of police and prison services. An alternate option for more lowfrequency users is the adoption of a task shifting approach to address community-based rehabilitation service gaps, which was suggested by a number of studies in the review period.17,28,37 However, there are no intervention studies that provide evidence of the effectiveness of this approach in South Africa. Integrated primary mental healthcare for CMDs needs to adopt a stepped care approach which ensures identification and referral of CMDs for either medical or psychological treatment as indicated. Lund et al.27,31-35 have done extensive work in South Africa calculating the resources required (beds, staff and facilities) to meet the service needs of people with severe mental disorders; as well as the beds, staff, facilities and budgets required to develop community-based mental health services34 and to develop child and adolescent mental health services.35 These modelling studies take into consideration the need to balance de-institutionalisation with the development of community mental health services. As mentioned under the sub-heading of identification and treatment of CMDs at PHC level, the need for HIV/AIDS treatment programmes to include mental healthcare services is highlighted by a number of studies reporting on the co-morbidity of HIV/AIDS and mental disorders.76,89,90 These studies reveal high levels of CMDs associated with HIV (47.3%),76 especially depression, HIV-related posttraumatic stress disorder (PTSD), alcohol abuse,76,89,90 and elevated suicide risk.77 Given the high rate of HIV in psychiatric patients, 2 studies also indicated the need for mental health services to include HIV/AIDS prevention interventions for MHSUs with severe mental disorders, recommending staff training and institutional support to this end91,92 as well as the introduction of provider-initiated HIV testing for this population.93,94 One study indicates that individuals with anxiety or depressive disorders are more likely to engage in inappropriate behaviour change strategies95 and a further study demonstrated that men with CMDs may also be more prone to high risk sexual behaviour.96 These studies suggest the need for HIV risk reduction interventions with individuals with CMDs as well. Building on research gaps identified in Thom's review of mental health services prior to 2000, this review indicates that there has been significant progress with epidemiological studies, with the SASH study providing the first nationally representative epidemiological data base on CMDs. There has, however, been little progress made with intervention and economic evaluation studies. These remain research gaps, with close to 50% of the mental health services articles reviewed reporting on descriptive studies of the status of mental health services since 2000. A large number of these studies focused on the effects of the new Mental Health Care Act.5 The need for this comprehensive systematic review of mental health services research is highlighted by the finding that there had only been 3 related review studies since 2000, all of which focused on specific issues. Collectively, studies on tertiary inpatient admissions and care, symptom management at PHC level, and community-based psychosocial rehabilitation provide corroborative evidence that there has been some progress with decentralised care, but that a number of setbacks and challenges remain. On the positive side, there is relatively wide availability of psychotropic medication, and PHC clinic nurses are generally comfortable with providing follow-up maintenance medication for MHCUs with severe and chronic mental disorders. On the negative side, while there has been a reduction in psychiatric hospital bed numbers, there has not been sufficient investment in the development of community-based psychosocial rehabilitative services to support de-institutionalisation. The result has been 'dehospitalisation' and the development of the classic revolving-door phenomenon. This has also been the case in other countries where there were insufficient community-based rehabilitation programmes to support de-institutionalisation.97 Further, a number of studies indicate that the introduction of the 72-hour emergency management and observation period in designated regional and district hospitals in the absence of sufficient dedicated infrastructure and specialist staff as well as inadequate training and support of general staff, has negatively affected the quality of care provided. The review suggests that, in the absence of dedicated resources and adequate training and support of general staff, this additional responsibility places further strain on an already overburdened primary healthcare system, introducing the possibility of human rights abuses that the MHC Act seeks to prevent. In the face of limited specialist resources, a recommendation for closing the treatment gap for CMDs is the adoption of task shifting within a stepped care approach. PHC staff servicing general as well as vertical antenatal, postnatal and HIV/ARV clinics would need to be trained and supported to identify CMDs, and manage and refer where appropriate. Because PHC staff are overstretched, harnessing trained community care workers to deliver manualised psychosocial interventions for specific conditions, where appropriate, is suggested. There is emerging international evidence of the effectiveness of such approaches from other low- and middle-income countries.98,105,106 This approach also provides the potential for promoting culturally congruent care by overcoming racial, class and language barriers that act as impediments to help-seeking behaviour. In line with the above service recommendations, future mental health services research needs to focus on intervention and economic evaluation studies of evidence-based culturally appropriate packages of care using a task-shifting approach at the health facility and community levels of care. These should include community-based psychosocial rehabilitation and the identification and management of severe and common mental disorders. Organisationally, intervention and economic evaluation research is also needed to understand the human resource mix and costing for the delivery of integrated packages of care at district level, including training and supervisory needs, organisational arrangements that promote cultural congruence, and capacity development needs for staff, e.g. training and sensitisation workshops and evidence-based programmes to improve communication and attitudes of staff towards users with mental disorders. Acknowledgement. We thank Kim Baillie for the research assistance she provided on this project, and for funding from the Mental Health and Poverty Research Programme Consortium (RPC) funded by the United Kingdom (UK) Department for International Development (DFID) (RPC HD6 2005-2010) for the benefit of developing countries. The views expressed are not necessarily those of the DFID.